NCHS has released a Health E- Stat that gives a provisional count of birth in the United States. 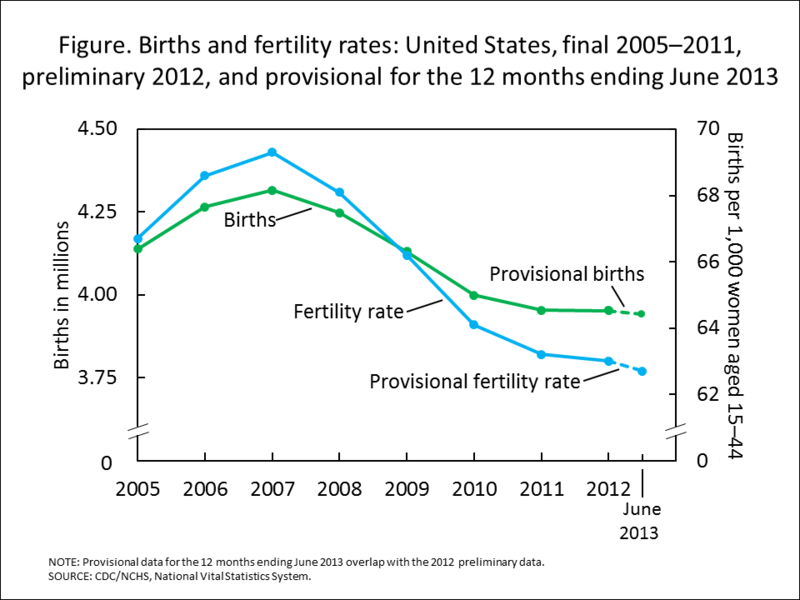 The provisional count of births in the U.S. for the 12-month period ending June 2013 was 3,941,000, which was not significantly different from the 3,944,000 births (provisional count) for the 12-month period ending June 2012 . The number of births has declined from the historic high of 4,316,233 in 2007. However, the decline has slowed from 2010 through 2011, and the number was essentially unchanged from 2011 through 2012. This entry was posted on Friday, December 6th, 2013 at 1:05 pm and is filed under Births. You can follow any responses to this entry through the RSS 2.0 feed. You can leave a response, or trackback from your own site.